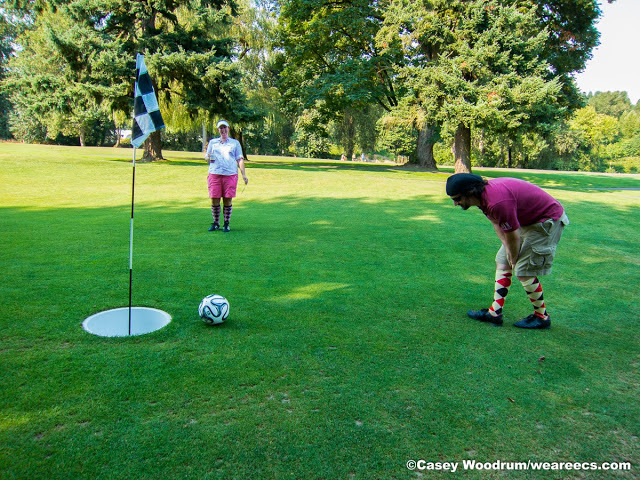 Exciting news - we are happy to announce that the 2015 ECS FC Footgolf Open will take place on Saturday, July 25th at 2 PM at Foster Golf Links! Ticket info to be announced at a later date, so be sure to follow our Facebook and Twitter page for updates. Don't miss out - this was one of our best events of 2014! Two of our ECS FC teams have made the GSSL Spring 2015 playoffs, set to be played on May 16th-17th! Congratulations to both ECS FC Columbia (Division 4) and ECS FC Blue (Division 2B). If you're not traveling to Vancouver for the Sounders match this weekend, we'd love for you to come out and support our boys! If you're unable to come see us play (perhaps you'll be in Vancouver instead! ), be sure to follow our Twitter feed (www.twitter.com/ECS_FC) for match updates! What an absolutely fantastic weekend! Beating your rivals in the two mens' matches is a fantastic achievement, but to do so in such dramatic fashion in PK shootouts made the whole day that much more memorable. Just as exciting for our club, 2014 marked a new tradition with our first-ever women's game. We were all so anxious to see it come to fruition, and although the result didn't bounce in our favor, we are so pleased that we were able to make this match happen and are so excited for the future of the game. We're already all eagerly awaiting all of the matches in Seattle in 2015! Thank you SO MUCH to everyone that helped make this day happen. Thank you to our players, who worked so hard to prepare for the matches and were heroes for all of ECS. Thank you to our wonderful fans, who traveled down early to lend their support and their voices for the cause. Thank you to our photographers and videographers, who spent hours working hard and providing these amazing photos and footage that everyone loves. Thanks to our live-tweeters, who helped us to hit trending status in Seattle on Twitter during our tense penalty shootouts. Thank you to those who brought supplies, toted gear around, ran errands, and helped to plan and facilitate everything from start to finish. Thank you to Redhook Ale Brewery and Golazo who were gracious and generous sponsors for the day. Thanks to the Anchor and Rose 48s for joining us and helping to plan the fantastic afterparty at Spirit of 77. Thanks to our hosts, Timbers Army FC, who may be our rivals on the field but have always been great partners in setting up this event and making these matches so special. 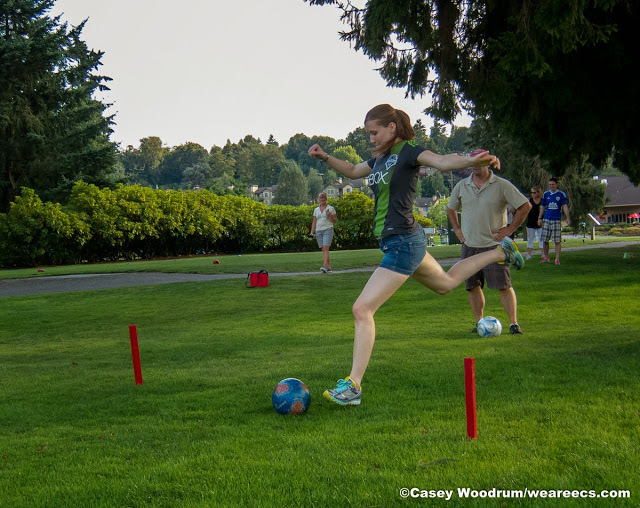 And thanks to everyone who came out for our Footgolf Open earlier this month - fundraisers such as that are what helps to sustain our club and make days like this possible! 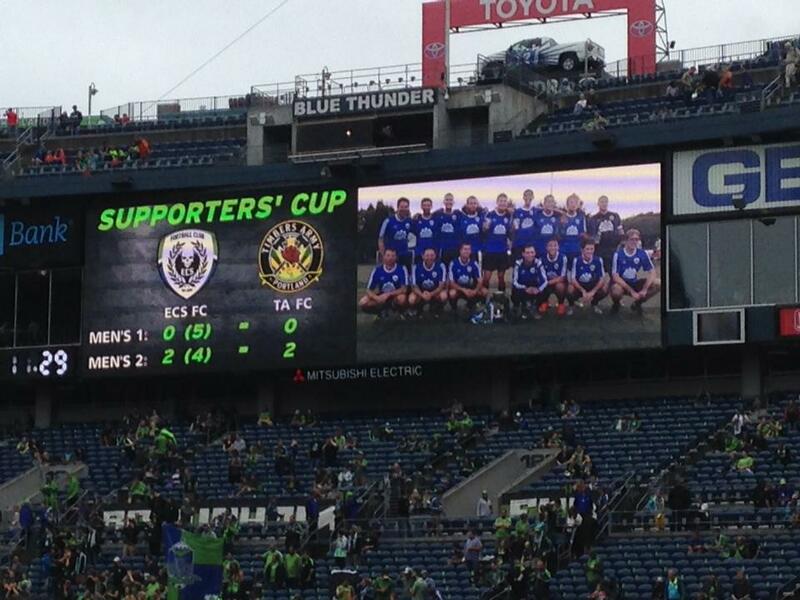 As seen in the photo above, we were honored to have our first team trophy photo displayed on the CenturyLink Field big-screen prior to the Sounders v Colorado match on the weekend following the Supporters' Derby match. Our friends over at Radio Cascadia featured the match in a segment of their eight episode, which you can listen to here. Finally, we are also incredibly excited and honored to announce a very special edition of "In The 18" covering the supporter matches. "In The 18" is produced by "American Football" creator and ECS member Scott Levy. The 20-minute film features stunning footage of the matches and is a special treat, especially if you played in the game or were there to watch. I highly recommend this film for all players and fans of ECS FC, as it so perfectly captures the emotion and tension of the day. ECS FC vs. Timbers Army FC, 2014 from LEVYfilms on Vimeo. PORTLAND - It took the drama of penalties, but the Emerald City Supporters FC came through when it counted. With nail-biting victories in two of three matches against Timbers Army FC, ECS FC once again hoisted the Supporter's Cup in 2014 to signify their place as the top supporters' soccer club in the Pacific Northwest. 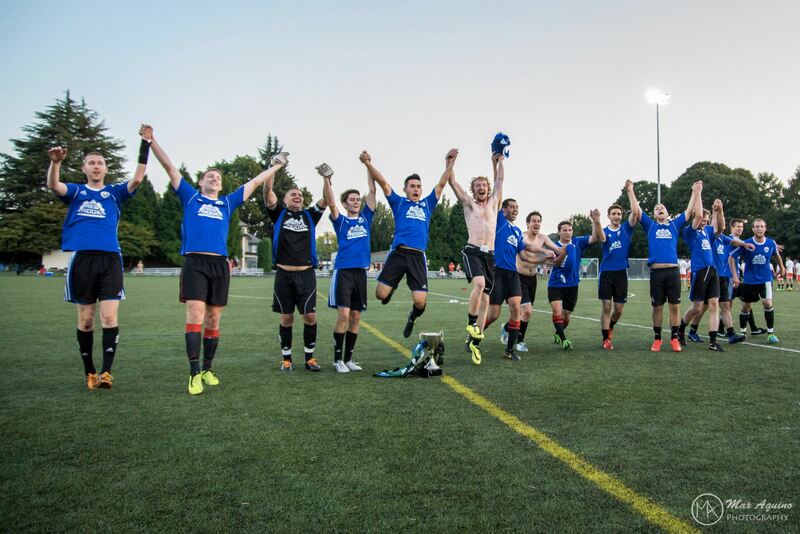 The penalty shootout victory following a tense scoreless 90 minutes in the Men's I match earned ECS FC the Supporters' Cup for the second time in the two years of the trophy's existence. The Men's II match featured plenty of its own intriguing storylines, with ECS FC fighting back from a 2-0 deficit to tie the match late and eventually win in penalties. And although the ECS FC Women fell 2-1, their landmark match marked the special first iteration of a women's match in this series, which has expanded from one match to three over the span of five years. Opening the slate of matches at Portland's Buckman Park were the ECS FC Men's II team taking on Timbers Army FC's North End United while the ECS FC Women simultaneously faced off against Whipsaws FC. Unfazed by the hot August afternoon sun, over 100 fans lined the fields at Buckman to support ECS FC. Some had gone out of their way to travel to Oregon early before the Sounders-Timbers match the following day, while others – notably, members of Anchor-N-Rose 48s – came from all parts of Portland to support their fellow ECS members and Sounders fans. The ECS FC Men's II team fell behind early to North End United, conceding two first-half goals in quick succession, which delighted Timbers Army fans and even prompted a celebratory smoke bomb. Facing a 2-0 deficit at the halftime break, ECS FC made key adjustments which turned the match into their favor. The advantage in second half run of play nearly paid its first dividends midway through the second half when a handball call in the penalty area went against North End United. 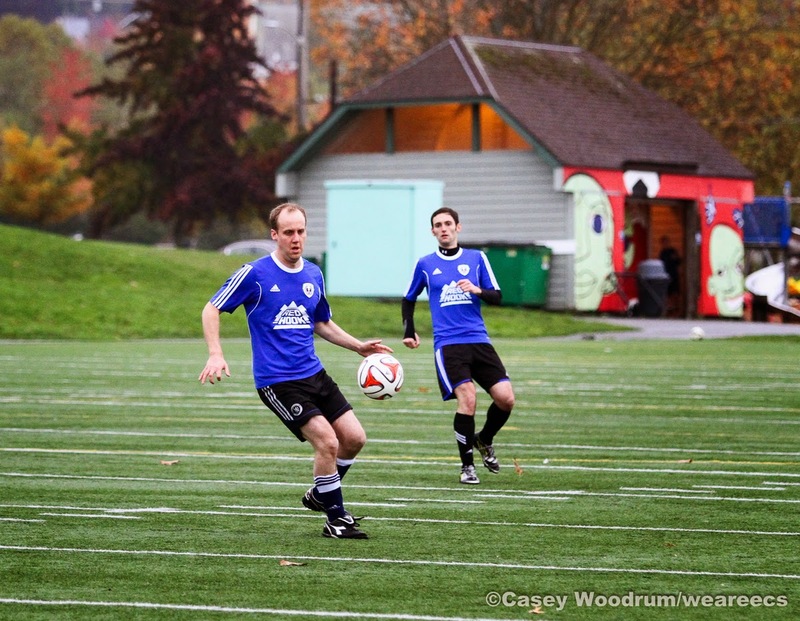 ECS FC captain Dennis Álvarez stepped up to the spot, but his shot flew just high of the bar. The breakthrough was to come just a few minutes later, however, when ECS FC midfielder Adam Chromy headed a corner off of an opposing defender and flicked the deflection into the back of the net. Chromy, fighting through an injured wrist suffered in the first half, played the hero when he headed in the tying goal off yet another corner kick with less than five minutes remaining in the match. With the score knotted at two apiece, the match proceeded to penalty shootout. Punctuated by a magnificent save by keeper Marcus Chromy – the goal-scorer's cousin – and a clinching kick by none other than Álvarez, ECS FC capped the comeback by winning the penalty shootout 4-3. In the match taking place concurrently on the other field, the ECS FC Women proudly took the field in their first-ever appearance in this rivalry series. Having worked diligently throughout the summer to prepare, ECS FC eagerly looked forward to this match. Their opponent, Timbers Army FC's Whipsaws FC, feature in Portland's Northwest United Womens Soccer league, and had been equally as anxious to welcome their rivals to town. Whipsaws grabbed the initiative early with a first-half goal, and tacked on another in the second half to take a 2-0 lead. Midway through the second half, ECS FC broke through with a goal from midfielder Sarah Montgomery, assisted by forward Jenny Blakely. Though ECS FC pushed hard for the equalizer, they ultimately fell short. Though the match ended 2-1, anticipation of the 2015 rematch in Seattle already has begun, and ECS FC will be looking for their chance to earn their first win. In the main event of the day, ECS FC Men's I squared off against FC Portlandia for the chance to bring home the Supporter's Cup. Led by goalkeeper Jason Rojo featuring in his final match as first team captain, ECS FC looked to retain the trophy for the second year running and improve the 3-1 record for the men's first team in the series. The match flowed back and forth for much of the game, with both sides fighting for every inch of the field. A first-half chance by ECS FC forward Matt Martens rocketed off of the crossbar, mere inches away from being the opening tally. FC Portlandia had their fair share of good opportunities, including a late second-half miss just wide of the far post. ECS FC center backs Christian Nichols and Cam Ballantyne featured with fine performances, and Ballantyne made one of the most crucial plays of the day when he slid in to block away a shot that appeared to be bound for the back of the net. Midfielder John Troka covered every inch of the park for ECS FC and nearly broke open the match late with some daring offensive efforts. Despite both team's best efforts, the match ended in a scoreless draw and the fans were once again subject to the heart-stopping drama of penalty kicks. Thanks to a vital save from goalkeeper Rojo, and the conversion of the winning penalty by Ballantyne, ECS FC took home a 5-4 shootout win and proudly raised the trophy for their joyous fans. To cap off a wonderful weekend, ECS FC players and fans chanted and sang their way to a Seattle Sounders 4-2 win over the Portland Timbers at Providence Park the following day. 2015 is poised to see yet another TA FC – ECS FC series, set to take place in Seattle in conjunction with a Sounders-Timbers match weekend. Excitement is already building and plans will soon be falling into place for these very special games next year. 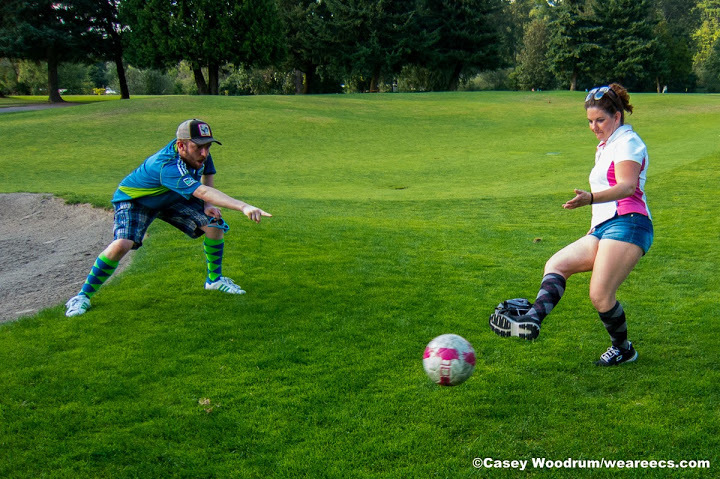 Thank you to everyone who joined us for the 2014 ECS FC Footgolf Open! The event was a fantastic success and was a great fundraiser for our club. Congratulations to Justin Haberly, who won the competitive division with the lowest overall score. Keep an eye out for the announcement of the next tournament, during summer of 2015! ECS FC Presents...the Beer for a Year contest!